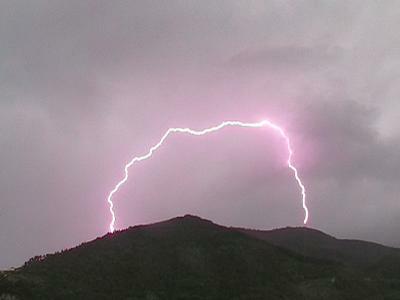 The above photo showing a bizarre arc of lightning was captured near in southeastern France, near Menton, on May 10, 2006. Since the ground is charged opposite that of a cloud base, and will not discharge to itself, it's likely that this picture is showing two cloud-to-ground strokes. Perpsective makes it appear as though a single lightning bolt is arching above the hill top.